Alpine function meets lifestyle. The Chamuera HS Thermo Hooded Parka was named after a valley in the Engadin region of Switzerland. The cut and color were also inspired by this landscape. 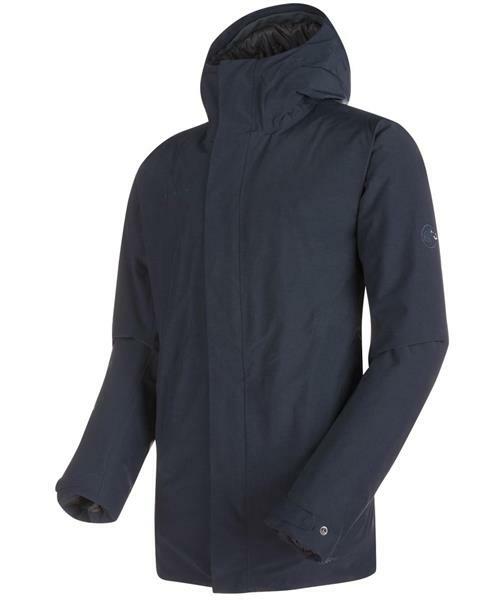 The parka impresses not only in terms of form and color, but also function: Thanks to DRYtechnology and a 10,000 mm water column, this hard shell parka with an attractive cotton/polyester look provides effective protection against wind and rain. The synthetic-fiber Ajungilak® OTI™ Element incorporated into the torso and arms also keeps you dry and warm on cold days. Other practical details include an internal zipper pocket with a multimedia cable outlet, a 2-point hood adjustment system and a concealed 2-way front zipper.